Bushwalking Skills: Bushwalking Navigation | How to make a customised, calibrated map from an .ecw map file. Bushwalking Navigation | How to make a customised, calibrated map from an .ecw map file. Do you have a Mac computer? 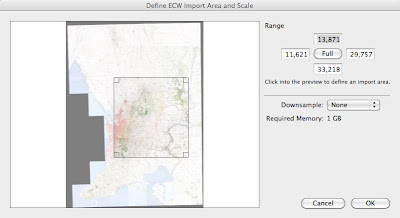 Want to know how to use a ecw map file to produce a customised, calibrated, topographic map? Don't know which software to use? Don't want to use a Windows emulator? Not sure which map datum to use? It is of course possible to use OziExplorer on a Windows computer or emulate a Windows machine on your Mac, but these are a poor substitute for powerful, user friendly software, running natively on a Mac. 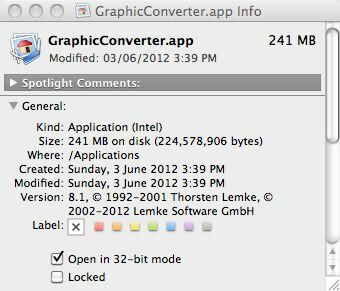 I assume that you are using the latest version of Graphic Converter (GC) (there is a trial period so you can fully test it before purchasing) and have it running in 32 bit mode. You can do this by control clicking on the GC file icon, selecting the Get Info box and then checking the "Open in 32 bit mode" check box if this choice is available [ see diagram] NB ecw files won't open in 64 bit mode and you will get an error message if you try to do so. MacGPS Pro doesn't have a demo version, but it does have a 30 day money-back guarantee. MacGPS Pro also has an iPhone/iPad/iTouch version iHikeGPS which is suitable for New Zealanders and North Americans, due to the availability of free maps. Australians miss out as our maps have to be purchased. 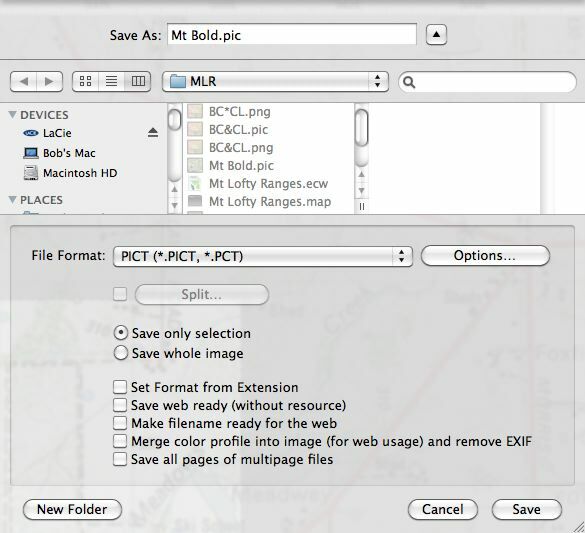 Bit Map (Australian design) allows uploading and viewing of custom maps made using the technique outlined below, using an iPad or iPhone, which is something that few other apps can do. While its plotting features are not as complete as MacGPS Pro, it does allow the plotting of waypoints and routes, or uploading from an OS X mapping application such as MacGPS Pro via iTunes. 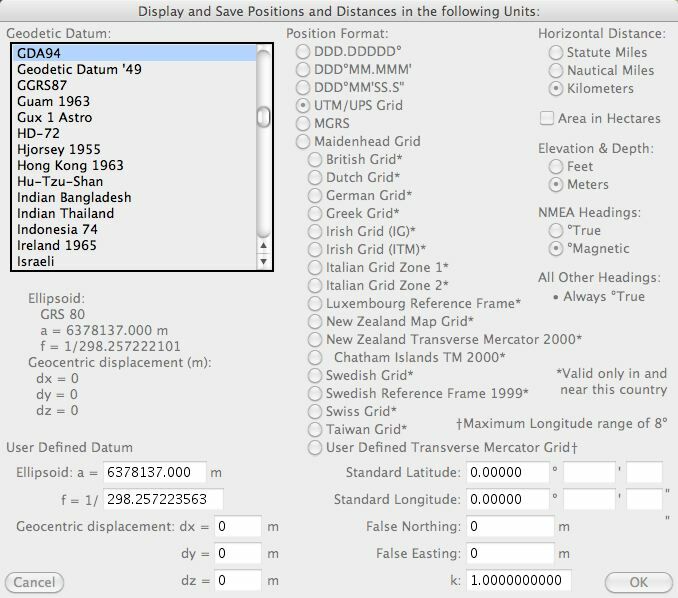 Like MacGPS Pro it allows live viewing of your current position using the built in GPS. Disclaimer: I have no relationship with the developers of the software discussed above. For my review of Bit Map click this link. IMPORTANT: If you have a small (a few map tiles only) .ecw file and the accompanying .map geo-referencing file is in the same folder, then MacGPS Pro will open and calibrate the ecw file, as soon as your drop it on the MacGPS icon, without any further action on your part. 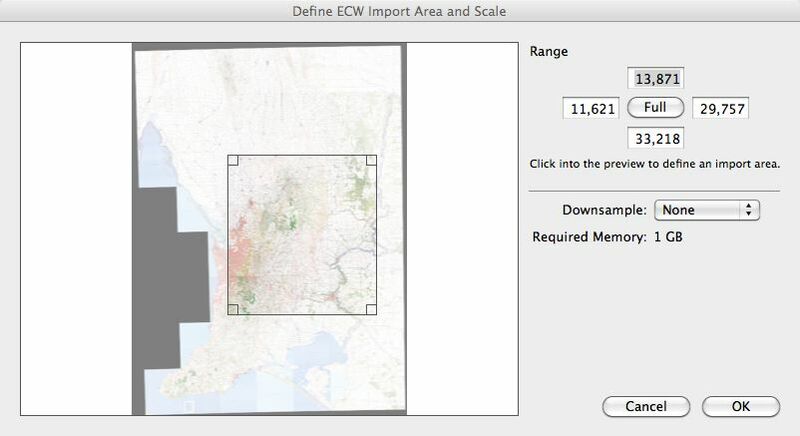 If you don't have the corresponding .map file then you will need to calibrate the newly imported ecw file as in Step 7. 1. Drag the ecw file from your CD to the GC icon, and dialogue box below will pop up. Select a slightly bigger area than you want by dragging the square corners of the large box [see diagram below] and then position the box by dragging from the middle of the box. Select Downsample. "None", then click OK. HINT: It doesn't need to be accurate at this stage. Just make sure the area of interest is inside the selected area. 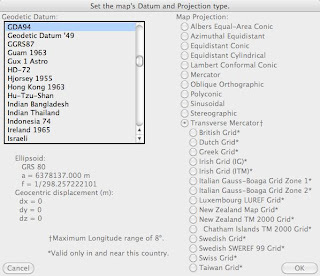 which should correspond to the map datum of the paper maps you have or will be purchasing. If you intend printing labelled maps directly from MacGPSPro as pdfs, then I would suggest you set to GDA94, as this is most likely to be compatible with the maps of others in your group. 4. Drag the cropped pict file from your Finder onto the MacGPS Pro icon. Complete this for any four easily recognized features (eg trig point, windmill) located near the four corners of the map, using a hard copy of the map to provide the 7 digit eastings [eg 0262600] and northings [eg 6553800]. Click DONE. HINT: Make sure you have zoomed in as far as you can, without the map becoming too pixelated, using the zoom icon top right, to increase your accuracy. 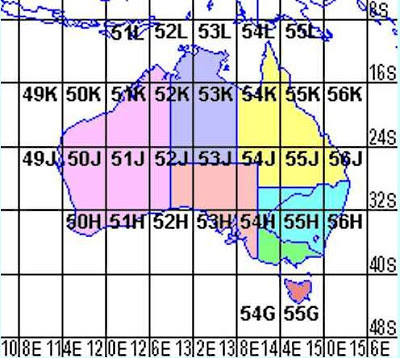 VERY IMPORTANT: If you are using an ecw file from a TOPOMaps version 2 disc (South Australian), then be aware that the grid lines on the ecw file are those of the AGD84 datum, as the file has been scanned from pre-94 maps. If however, you open these maps in OziExplorer you will find that the associated .map file (found on the disc) has calibrated the maps as GDA94 hence the disc markings. The map image displayed (in OziExplorer) has been recalibrated to the Geocentric Datum of Australia 1994 (GDA94). The Easting and Northing readouts for any point at the cursor position will in GDA (94) coordinates. The warning above is very important, if you normally use grid line intersections as your calibration points, as this will result in inaccurate calibration, with the whole map displaced 100-200m. If you use recognized topographic features this problem doesn't exist. HINT: To speed up the process in case you need to start over again, keep a record by printing a copy of the map and annotating it with the four corner grid references which you previously entered. 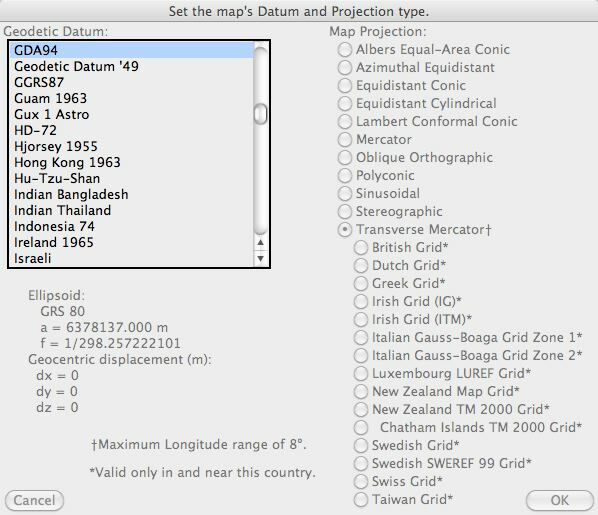 If MacGPS Pro won't let you click the DONE button it is probably because you made a mistake entering the GR and will need to start again, or perhaps you have failed to select a point on the map, to register the grid reference. Remember that the goal of calibrating a map, plotting waypoints and joining them to form a route using MacGPS Pro is so that you can transfer them to your GPS and use your GPS to find your location relative to these waypoints, on either a purchased map or one printed using the software. For this reason, the map datum set in your GPS MUST match the paper map you are carrying. 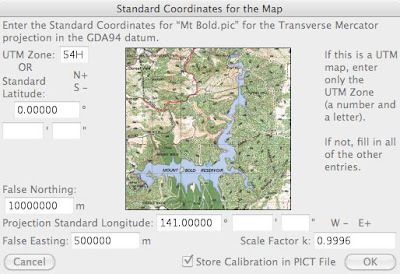 My next few posts will explain how to export your data from MacGPS Pro to your GPS, overlay the calibrated map you have produced on Google Earth to help you visualize the terrain and get the UTM coordinates from Google Earth by overlaying with UTM grid.